The aerial shall be able to rotate 360 degees over the short jacked side of the truck. A programmable logic control system allows the aerial to rotate over the short jacked outriggers while maintaining safe operating parameters. In the event the vehicle has been set up with one or more of the outriggers short set, any attempted operation outside the predetermined parameters shall automatically ramp the operation to a feather-soft stop. screen to alert the operator of the disabled function. The operator shall be able to return the aerial back to the safe operating parameters without the use of overrides. 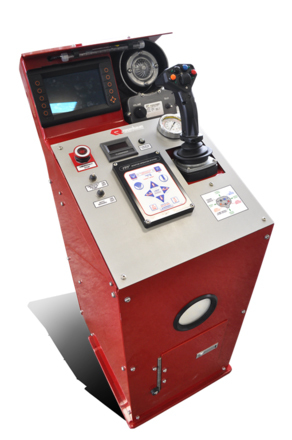 The main operator’s station and platform operator’s station shall have a switch for auto bedding in the SMART screen. 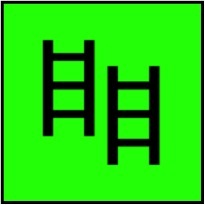 Activation of the switch when the aerial is within 20 degrees left or right of the ladder bed, below 20 degrees elevation and 75 percent retracted will automatically bed the aerial. Rotation Disabled, Down Disabled and Left Rotation Disabled. is pushed or the outrigger interlock is active. The radio remote control transmitter/receiver shall be powered by two batteries and shall operate approximately 300 feet from the truck. The transmitter/receiver shall have a belt strap for comfortable operation of the three (3) proportional aerial functions (raise/lower, extension/retraction, and swing left/right) and the three (3) toggle switches for monitor functions (shape/stream, up/down and left/right operations). One (1) switch to select left or right monitor. 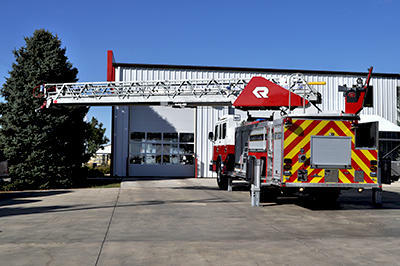 Rosenbauer Smart Aerials provide unmatched features that enhance the safety and performance Aerial and Platform. The SMART aerial uses CAN-bus and programmable logic control with encoder technology that monitors the aerials functions 16 times per second. That's unbeatable technology and safety when lives are on the line. 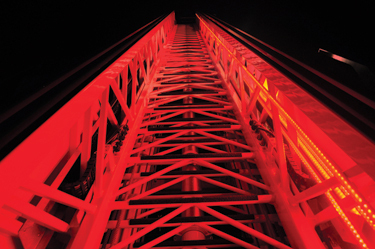 Impact sensors ensure no unnecessary damage is caused to the platform basket during aerial operations. These sensors detect any potential impact within 5 ft and will slowly stop the basket to prevent any collisions. 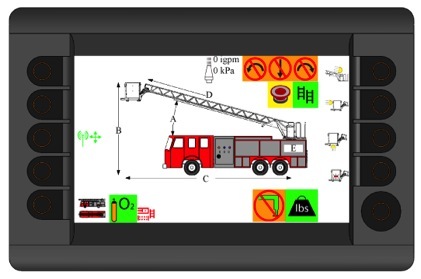 Operators can safety override when working in close proximity to buildings or rescue operations. There are four (4) sensors located on the front of the basket and two (2) sensors located on the sides. 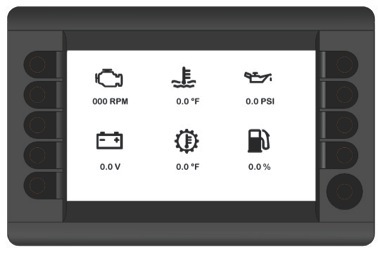 Simply activate the rung alignment button on the SMART screen and the rung light will illuminate to indicate the rungs are aligned. This will ensure safe climbing at all times. The outriggers are galvanized inside and out. The galvanizing includes the aerial outriggers' assemblies, beam, outer jack tube, inner jack tube, jack cover plate, and jack pads. The torque box is hot dip galvanized inside and out . The galvanizing includes the top, bottom and sides of the torque box, outrigger electrical compartment, and outrigger valve control compartment. 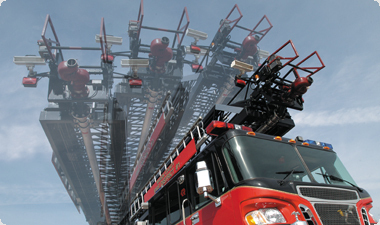 The aerial ladder is also available galvanized. 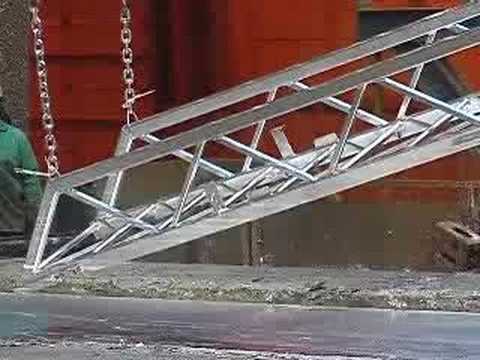 Galvanizing includes the basket, base rails, hand rails, diagonals, rungs and K-Braces. The galvanized aerial can also be painted. The process shall eliminate rusting, scratching or paint chips on the outriggers. The galvanizing shall provide the steel outriggers with both barrier and cathodic protection from corrosion. The galvanized zinc coating shall provide a barrier that shields the steel from the environment. Rosenbauer Aerials utilize a three (3) component swivel. 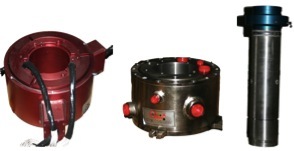 This modular design enhances serviceability as the Hydraulic, Electric or Waterway Swivel can be individually replaced. This ensures lower long term costs and reduced downtime. 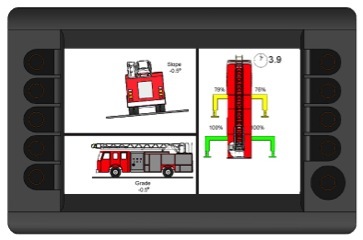 The Rosenbauer Smart Flow Monitor automatically regulates the flow of water based on the horizontal position of the monitor to ensure performance and provide safety.